Size doesn’t always matter, as Samsung’s NX500 squeezes in a 28Mp APS-C BSI (Backside Illuminated) sensor for high-resolution stills and 4k-video capture in a pocket-sized body. 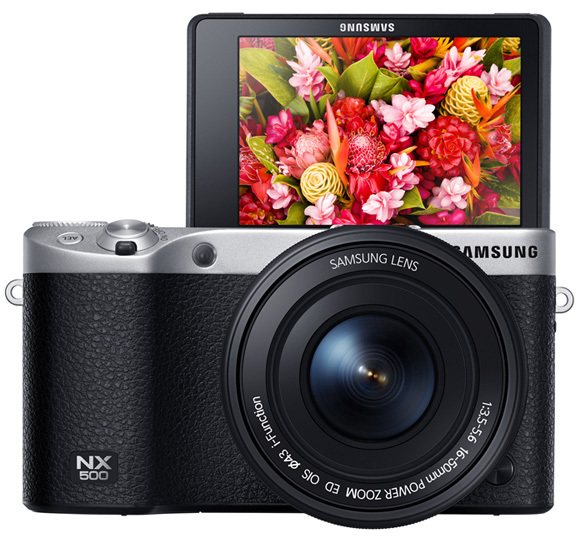 Taking the impressive features of the large NX1 camera and stuffing them into a pocket-sized body is no mean feat, and that’s what Samsung has managed with their new NX500 mirrorless hybrid. 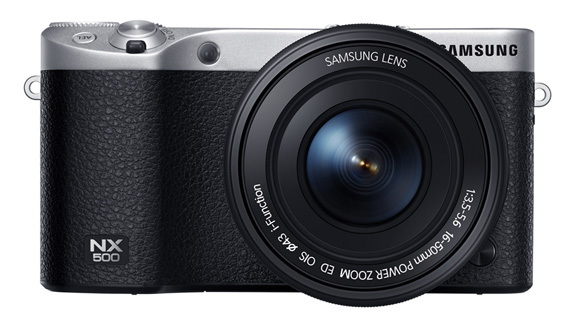 Built around the same Backside Illuminated 28Mp APS-C sensor in the NX1, the new Samsung NX500 not only captures high-resolution 6480 x 4320 pixel stills in either JPEG or RAW format, but captures 4k video, too. The NX500 can record 4k video (video with a resolution of 4096 x 2160 pixels) at 24 frames per second, Ultra HD 3840 x 2160 pixels at 30 fps, or full HD 1920 x 1080 pixels in a range of NTSC or PAL frame rates. Like the NX1, the new Samsung NX500 can also capture 4k video while simultaneously outputting a clean HDMI signal at 1080p. The impressive performance capabilities don’t stop there either, as the South Korean manufacturer claims its DRIMeV image processing engine delivers superior color reproduction and enhanced noise reduction. Continuous still shooting isn’t quite as impressive as the 15 fps on the NX1, but the NX500 will still crunch through a very respectable 9 fps. It also includes Samsung Auto Shot (SAS) that uses motion detection technology to ensure photographers don’t fire the shutter too late when shooting fast-moving action. With that in mind, the NX500 also borrows the impressive NX AF II hybrid autofocus system from the NX1, which boasts 205 Phase Detection AF points, including 153 cross-type sensors that cover much of the frame. Housed in a more diminutive and portable shell, obviously a number of changes to the camera’s exterior were inevitable. The new NX500 doesn’t offer headphones or microphone sockets for video, but crucially, it’s missing an Electronic Viewfinder, too. That’s going to be pretty significant lack for many photography enthusiasts, and quite possibly a deal breaker, but if you want a small camera, some sacrifices need to be made. Thankfully, the rear screen that you’ll be relying on for composition is a large 3.0-inch AMOLED LCD that boasts deep blacks for enhanced visibility in bright light. The LCD screen also flips and tilts to aid composition from tricky positions, as well as to facilitate a well-framed “selfie.” In addition to a small low-power external flash unit that comes supplied with the NX500 kit, the camera’s hotshoe will also take Samsung professional flashes, such as the SEF580A, for those after more power and versatility. The NX500’s native ISO sensitivity range extends between ISO 100-25,600 (expandable to 51,200), and with enhanced Bluetooth, Wi-Fi and NFC connectivity, Samsung claims even faster transfer rates to Samsung smart devices and TVs. The new Samsung NX500 will be available in black, white, and brown from March 2015, with the price expected to be around $800, including a 16-50mm kit lens.